On Survivor Season 38 Episode 10, a big advantage made everyone question the game. Watch the full episode online right here via TV Fanatic. On Survivor: Edge of Extinction Season 38 Episode 10, one castaway comes out on top after a crucial immunity win while alliances start to crumble. On Survivor: Edge of Extinction, Season 38 Episode 9, when two tribal councils take place in one hour, a surprise advantage may pay off for one castaway's game. On Survivor: Edge of Extinction Season 38 Episode 8, the latest Tribal Council heats up, and castaways strategize until moments before the vote. 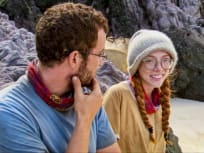 On Survivor: Edge of Extinction Season 38 Episode 7, a puppet master pulls the strings on other castaways while one struggles when exhaustion takes its toll. On Survivor: Edge of Extinction Season 38 Episode 6, the castaways face yet another twist as they try to survive being on the edge of extinction. "It's Like the Worst Cocktail Party Ever"
On Survivor: Edge of Extinction Season 38 Episode 5, targets begin switching from one castaway to another when their weaknesses are exposed. On Survivor Season 38 Episode 4, castaways switch things up, and "Edge of Extinction" heats up when an eliminated castaway has to face people they blindsided. "Betrayals Are Going to Get Exposed"
On Survivor: Edge of Extinction Season 38 Episode 3, two castaways try to get along and survive on the Edge of Extinction, and teamwork is key in a challenge. "One Of Us Is Going To Win The War"
On Survivor: Edge of Extinction Season 38 Episode 2, players bond together to try and get a returning player out a castaway is stranded on "Edge of Extinction." On Survivor: Edge of Extinction in Season 38 Episode 1, four returning players try to bond with their new tribe and tackle a giant puzzle in the first challenge.